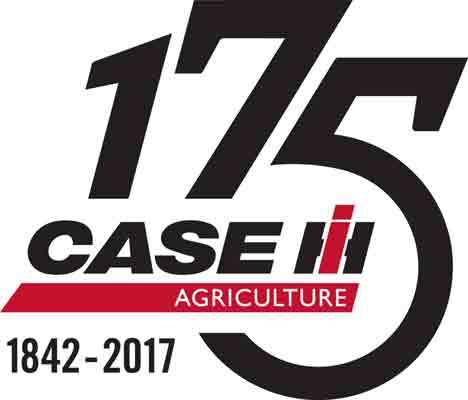 Case IH, a global leader in agricultural equipment, is beginning a year of celebrations to commemorate its 175th anniversary at its global headquarters in Racine, Wisconsin. It was there, on the shores of the Root River, that founder Jerome Increase Case established Racine Threshing Machine Works to produce a revolutionary machine to speed up the separation of grain after harvest. “I find it amazing to see just how far the farming industry and our company have come during the last 175 years, especially given the fact that we are stronger today than ever before,” Case IH President Andreas Klauser said. The company’s beginnings are closely linked with those of the American economy, as pioneers moved West and new farms were established to feed the growing population centers in the East. In 1869, Case went on to manufacture the first steam engine tractor, which, although wheel-mounted, was drawn by horses and used only to power other machines. In 1876, Case built the first self-propelled traction steam engine. As steam engines quickly replaced horses for threshing, the J.I. Case Threshing Machine Company became the world’s largest producer of steam engines by 1886. In 1902, five companies merged to form the International Harvester Company in Chicago, the deal being brokered, personally, by J.P. Morgan, the American banker who dominated corporate finance and industrial consolidation at the time. The company produced its first combine harvester in 1915 and, in 1923, introduced the Farmall, the world’s first row crop tractor. Providing greater productivity, reliability and safety, it was a revolutionary unified system of tractors and implements for plowing, cultivating and harvesting. International Harvester sold more than 5 million Farmall tractors and, in 1977, launched the unique single-rotor Axial-Flow rotary combine, which revolutionized the farming industry with its simplicity, grain quality, grain savings, crop adaptability, matched capacity and high resale value. Axial-Flow combines still set the standard for harvesting performance today. Case IH was formed in 1985 when J.I. Case acquired the agricultural division of International Harvester, uniting the legacies of Case and IH in a single brand. Its first product, the Magnum™ tractor with horsepower ranging from 160 to 240 horsepower, was introduced in 1987 and became the first tractor to win the Industrial Design Excellence Award from the Industrial Designers Society of America. Now producing up to 380 horsepower, the Magnum tractor continues to be one of the most recognizable Case IH products, and more than 150,000 have been sold. The revolutionary Quadtrac tractor, launched in 1996, established a new benchmark that remains unmatched. Now including the most powerful series production tractor in the world, the Steiger Quadtrac 620, with up to 692 peak horsepower, delivers the greatest pulling power. Since the turn of the 20th century, when Case IH reintroduced the Farmall brand, the company’s technical innovations have continued unabated. •	Case IH Advanced Farming Systems (AFS) has been at the forefront of precision farming for more than two decades, giving farmers the ability to maximize productivity and profitability by using satellite technology. •	In 2009, Case IH launched Continuously Variable Transmission (CVT) technology, which enables its CVT tractors to deliver an optimum combination of power and fuel efficiency. •	Patented Efficient Power engine technologies enable Case IH equipment to meet the latest Stage IV (Tier 4 B/Final) emission standards without complex exhaust gas recirculation systems or particulate filters. •	In 2015, the Magnum 380 CVT was voted Tractor of the Year at the EIMA International Exhibition in Bologna, Italy. That year, Case IH also launched the Rowtrac™ CVT tractor, which combines the individual benefits of tracked and wheeled tractors. •	Case IH’s award-winning performance continued during 2015 when the new Optum CVT tractor was named Machine of the Year 2016 at Agritechnica. The judges were impressed by its stunning “power pack” design, excellent power-to-weight ratios, maneuverability, efficiency and reliability. •	The Optum 300 CVT achieved the accolade of Tractor of the Year at the 2016 EIMA International Exhibition where the judges praised its high-power and low-weight design. Their decision acknowledges Case IH’s “focus on farmers” philosophy and the importance of Optum CVT in the growing the high-power/compact segment of the tractor market. •	Visitors to the 2016 Farm Progress Show were stunned when Case IH unveiled the Autonomous Concept Vehicle. Able to operate autonomously with a wide range of field implements, this groundbreaking concept is designed to make agriculture more efficient, economic and environmentally friendly at a time when finding skilled labor is becoming increasingly difficult for farmers in many parts of the world. “The Case IH 175th anniversary is a testament to many years of quality, perseverance and progress,” Klauser said. “It’s also an occasion to reflect on our guiding principles of innovative engineering, efficient power and Agronomic Design — a philosophy that will continue into the future. “I am certain that if Mr. Case could see the company today he would instantly recognize that the core values that he championed all those years ago are still at the heart of everything we do. I have no doubt he would approve of the fact that we involve customers in every new range, model and product update through our Customer Driven Product Design, but what he would think of the Autonomous Concept Vehicle we can only guess!